Russian physician; born at Poneviezh, government of Kovno, in 1846. Dembo studied Hebrew and rabbinical literature under the direction of Samuel Salant and other Talmudic authorities until the age of fourteen, when he devoted himself to secular studies, and in 1870 graduated as M.D. from the University of St. Petersburg. He served as physician in several hospitals, and in 1877, on the outbreak of the Russo-Turkish war, enlisted in the medical department of the army. He was awarded a medal for his services. In 1881-82 he traveled in Germany and France, and on his return to St. Petersburg was appointed physician to the Alexandrowski Hospital. In 1888 the government bestowed upon him the title of "privy councilor." 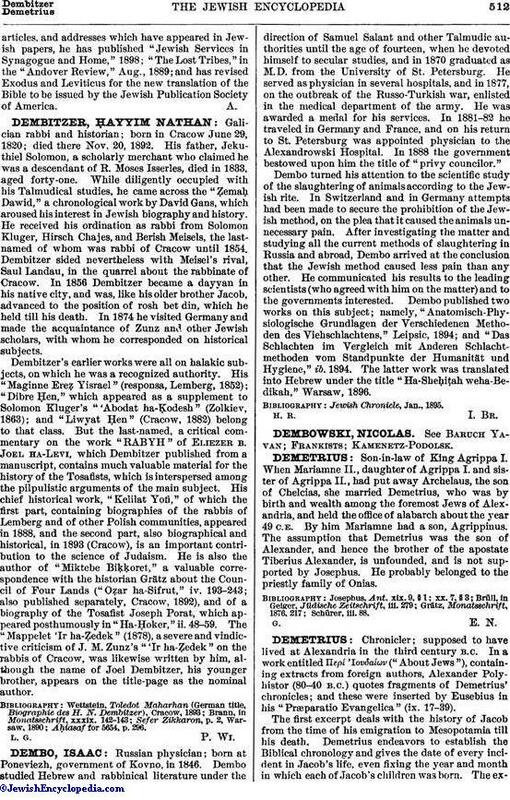 Dembo turned his attention to the scientific study of the slaughtering of animals according to the Jewish rite. In Switzerland and in Germany attempts had been made to secure the prohibition of the Jewish method, on the plea that it caused the animals unnecessary pain. After investigating the matter and studying all the current methods of slaughtering in Russia and abroad, Dembo arrived at the conclusion that the Jewish method caused less pain than any other. He communicated his results to the leading scientists (who agreed with him on the matter) and to the governments interested. Dembo published two works on this subject; namely, "Anatomisch-Physiologische Grundlagen der Verschiedenen Methoden des Viehschlachtens," Leipsic, 1894; and "Das Schlachten im Vergleich mit Anderen Schlachtmethoden vom Standpunkte der Humanität und Hygiene," ib. 1894. The latter work was translated into Hebrew under the title "Ha-Sheḥiṭah weha-Bedikah," Warsaw, 1896.